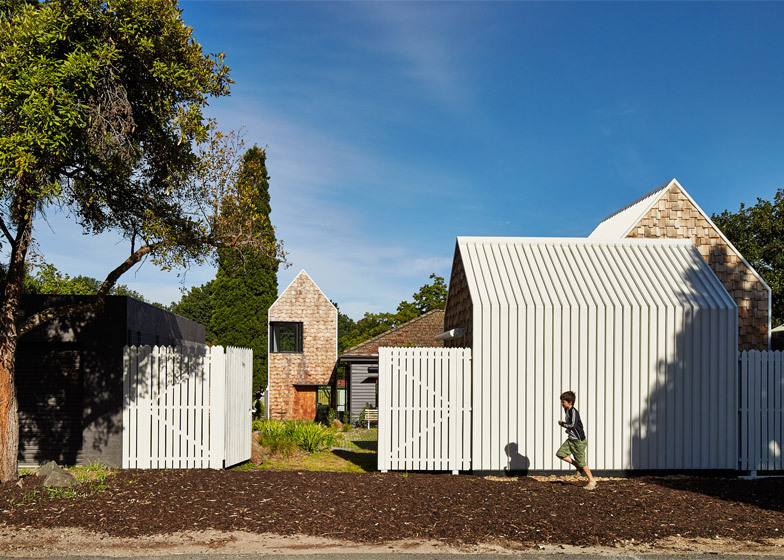 Australian architect Andrew Maynard has doubled the size of a house in Victoria by adding a row of skinny gabled blocks, intended to make the building look like a small village rather than a monolithic block (+ slideshow). 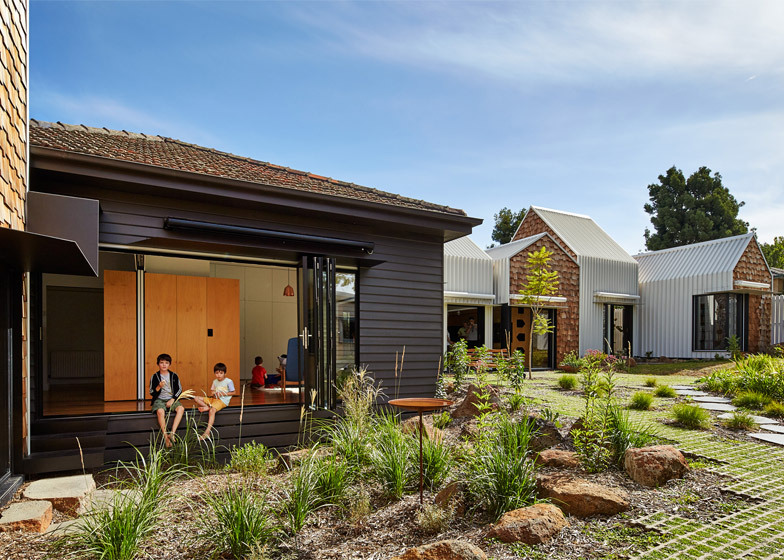 Located in Alphington, a suburb north-east of Melbourne, the house was no longer big enough to suit the needs of its residents – a couple with two eight-year-old twin sons. 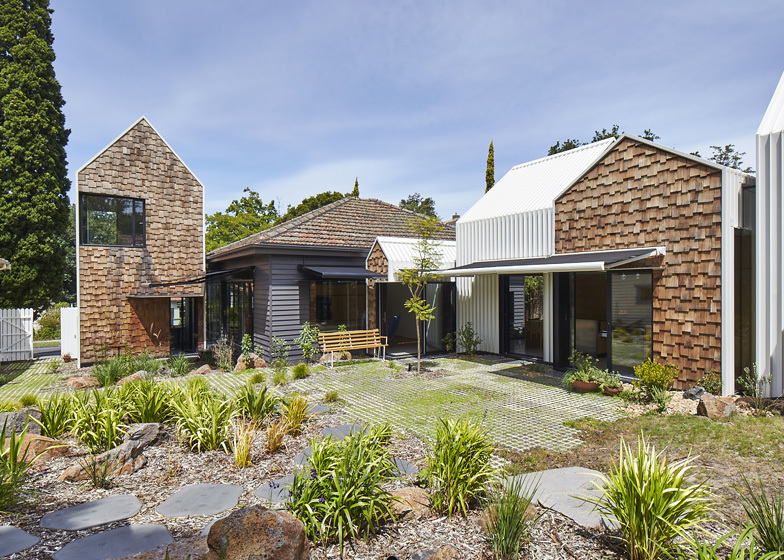 They asked Andrew Maynard Architects to extend the property into its extensive garden. 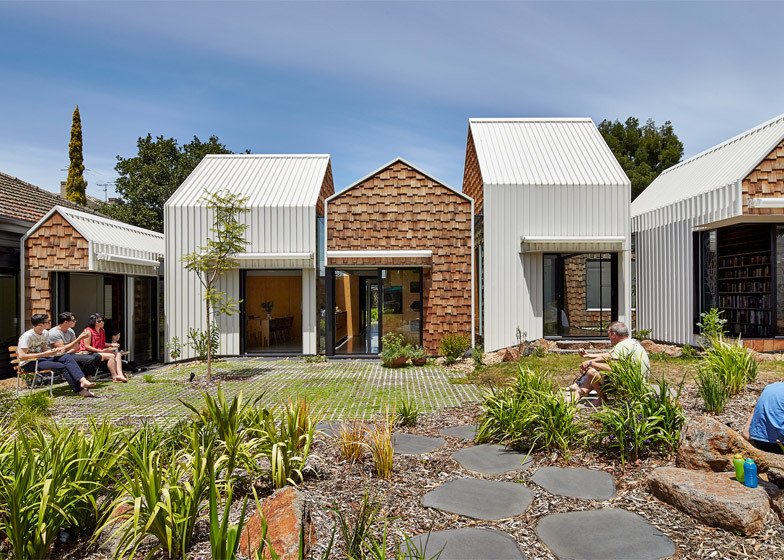 The brief was to create a residence that brings together community, art and nature, so the architect came up with a design for a cluster of volumes that could be mistaken for a group of small buildings, like a village. He named it Tower House. 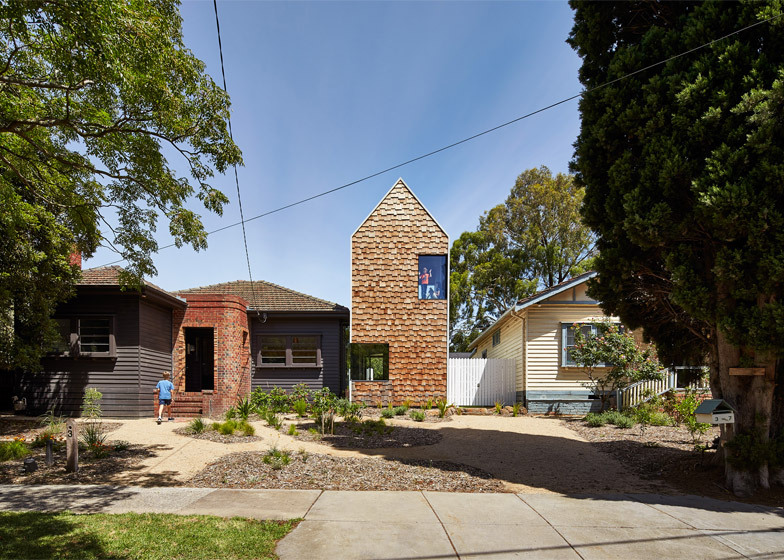 "Tower House is anti-monolith – it is village externally and a home internally," explained Maynard. 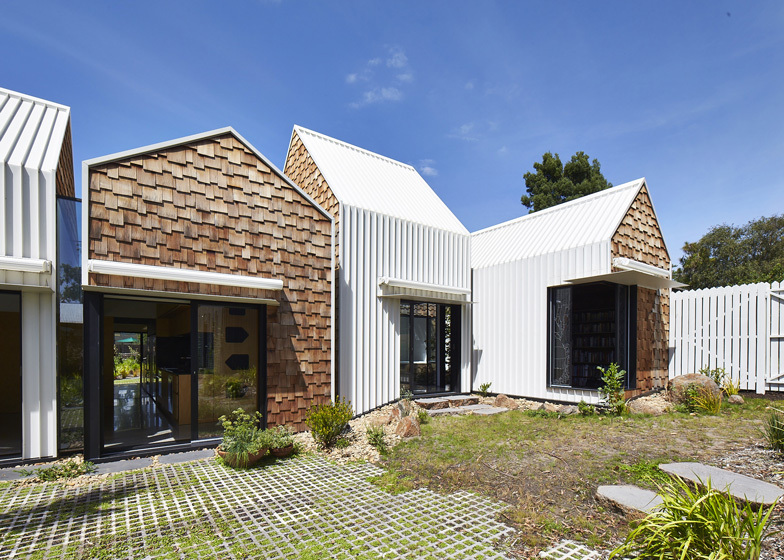 "The house defies logic as the exterior appears to be a series of small structures, while internally the spaces and functions are large and connected. Like the Tardis, it's small on the outside and large internally." 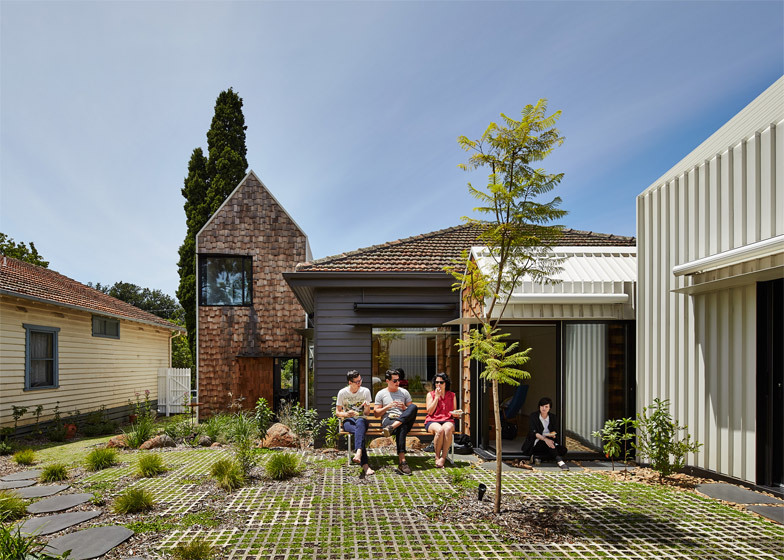 The original house is a single-storey structure built using red brick and dark-painted weatherboarding. 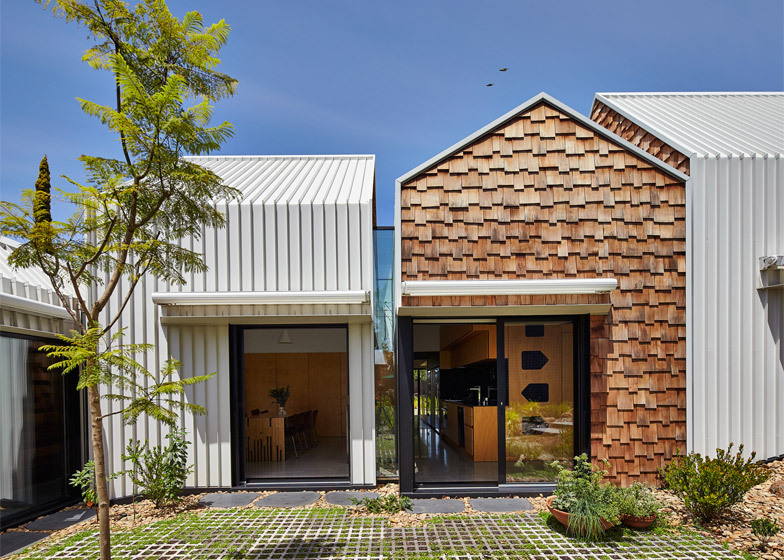 Rather than copying this, Maynard chose to add wooden shingles to the gable ends of the new blocks, while ridged metal wraps around the sides and over the roof. According to the architect, the roof surfaces were as considered as the walls. "Google Earth has made the roof the public face of our buildings, accessible to anyone at anytime," he explained. "With this in mind we deliberately designed Tower House so that it looked beautiful from the sky and from Google Earth." 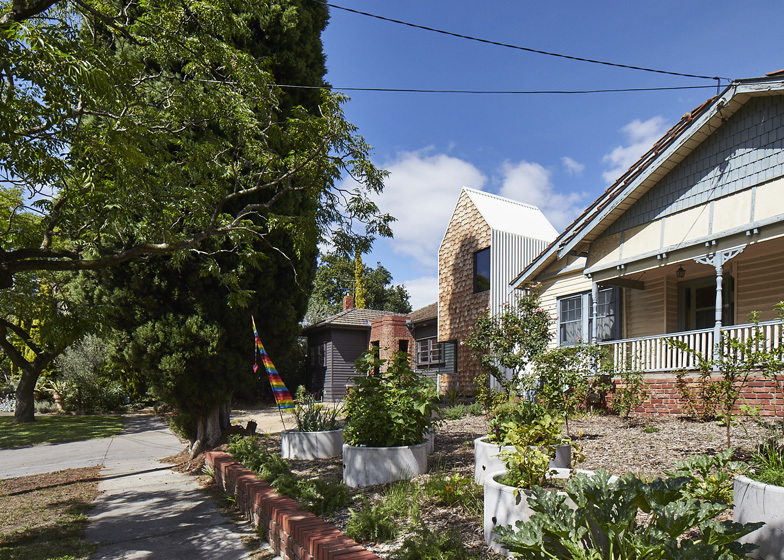 Only one of the new gabled additions – designed for the two young boys – is visible from the street, and this is the only part of the house to feature a second storey. The lower level contains a study where the two can work on their homework, while the upper level is a space for reading or relaxing and has a net for a floor. "The study is designed to inspire the boys as they grow and learn," said Maynard. 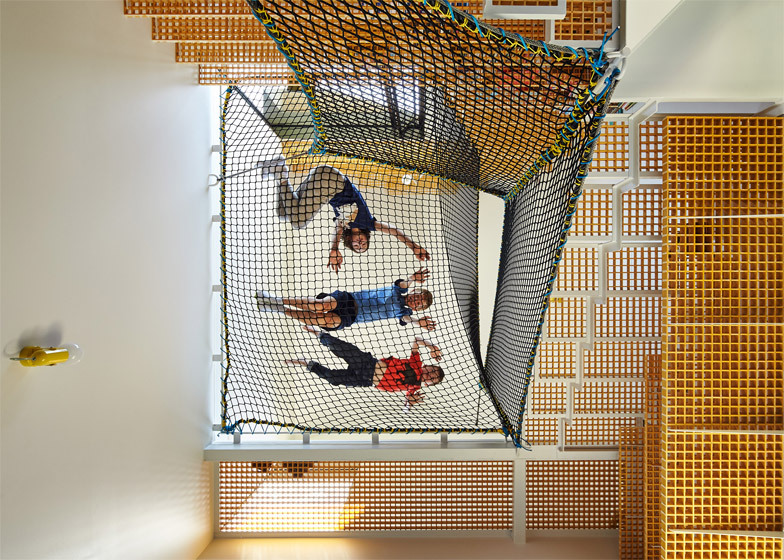 "Hanging within this tall space is a net where the boys can read, and contemplate with a view to the street and a view to the backyard." Inside the existing building, the spaces have been renovated to provide two bedrooms, a large bathroom and a pair of living rooms. 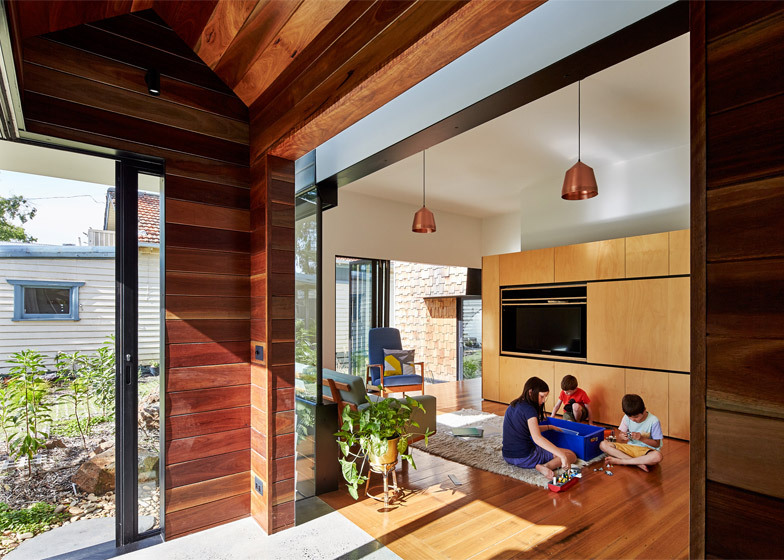 Sliding panels in the walls also allow these spaces to be subdivided. 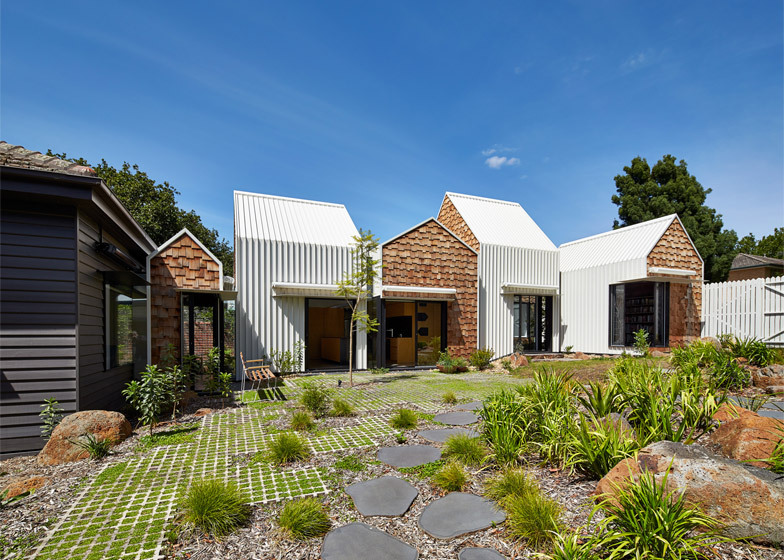 A connecting corridor between the main house and the bulk of the extension is contained within its own gabled block. Beyond this, four additional volumes line the edge of the garden to create a kitchen and dining space, a master bedroom and a small library. 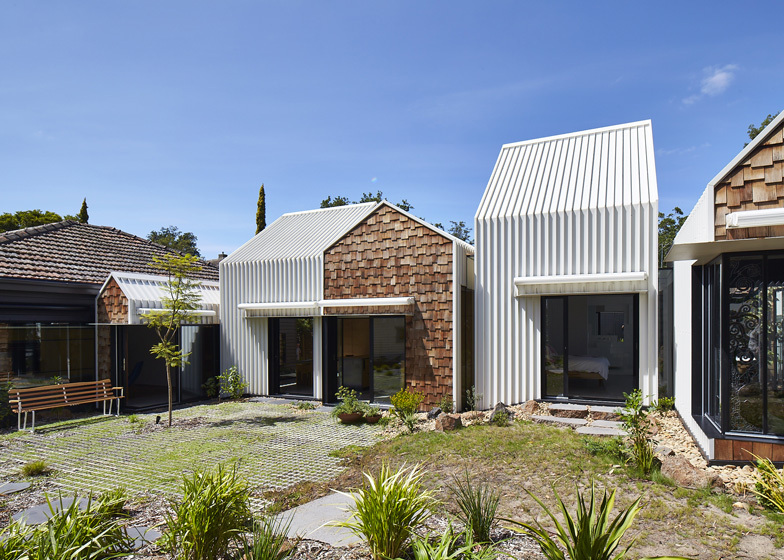 "The house can easily adapt from being a shared family home to being two separate zones with distinct entries," said the architect. The corridor leads through to the kitchen and dining space first. 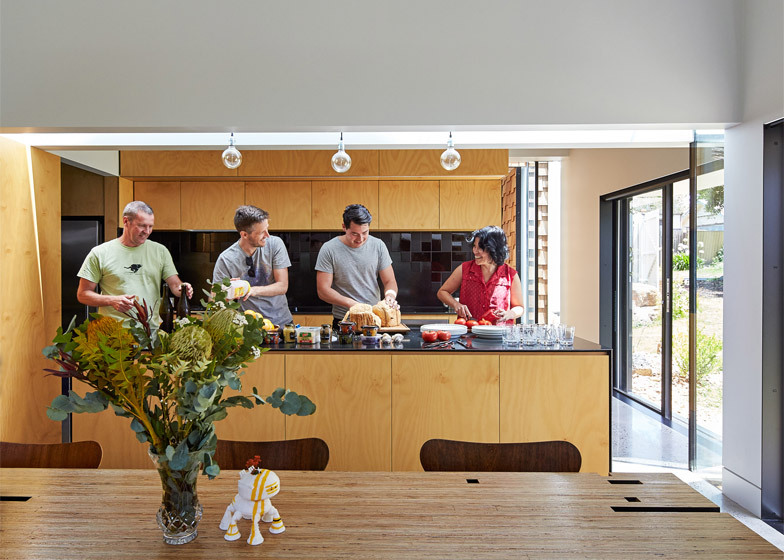 Wooden panels cover the worktops and cupboards, and also extend out along the wall beside the family dining table. 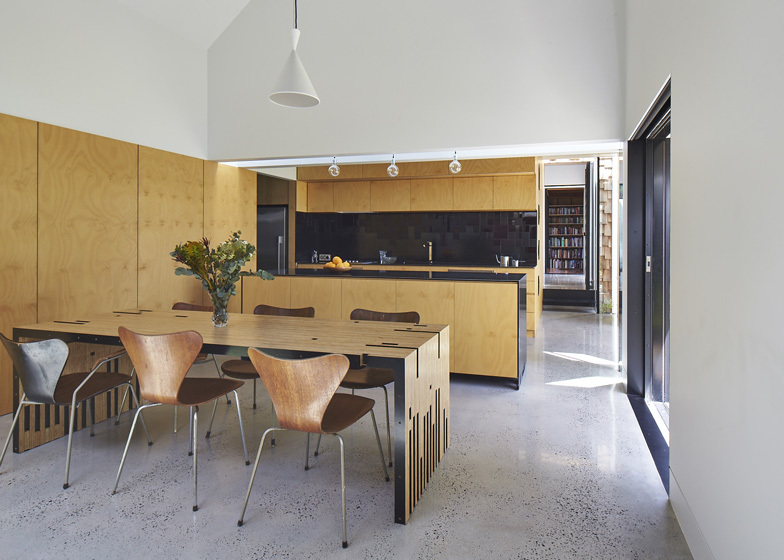 Other features include a narrow skylight, stainless-steel worktops and a series of house-shaped cubbyholes. These cubbyholes also form an informal ladder, leading up to a secluded loft space that has been carpeted with artificial glass and furnished with a sun lounger. Maynard describes it as a "hideaway within the centre of the house". 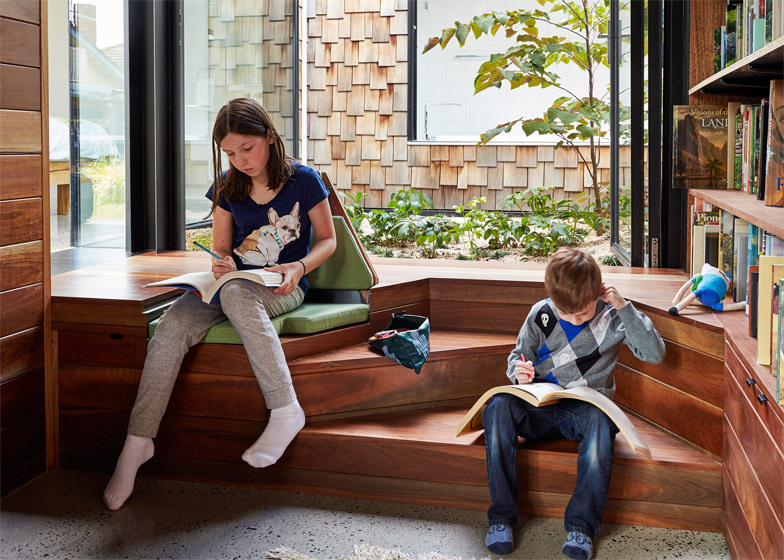 Beyond the bedroom, a library is lined with dark wood from spotted gum, its built-in bookshelves integrate a desk and a stepped seating area overlooks a planted courtyard. A final addition was made at the front of the property. 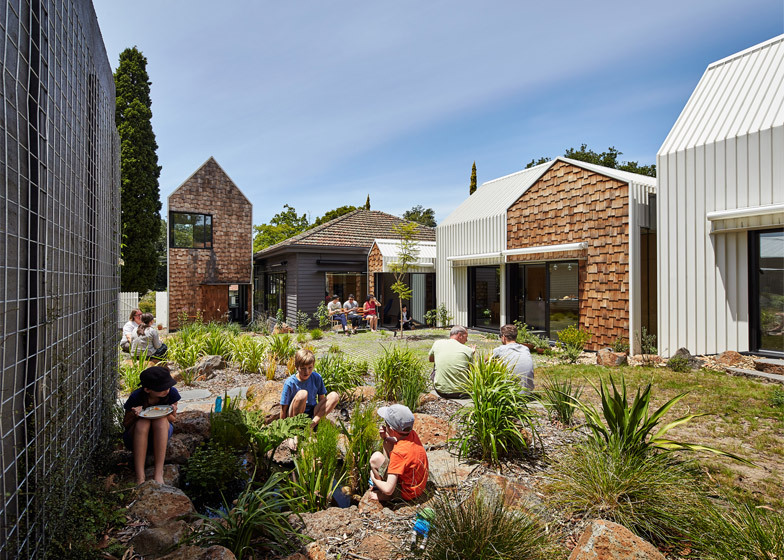 Rather than transforming the yard into a driveway, it was turned into a vegetable patch so neighbours could also use the space, helping to encourage a sense of community. "Tower House is the result of a vast number of concurrent discussions about issues far broader than the home itself," added Maynard. "It is the result of endless conversations with a trusting, enthusiastic, patient and encouraging client."